And what if the ECB respected its mandate! Article 127 of the Treaty on the Functioning of the European Union (TFEU), i.e. former Article 105 of the Maastricht Treaty, states clearly that “the primary objective of the European System of Central Banks … shall be to maintain price stability”. However, no precise quantification of this goal is given in the Treaty. The European Central Bank has interpreted this by stating that it would target inflation that is below, but close to, 2% over the medium term. Furthermore, Article 127 of the TFEU adds that, “without prejudice to the objective of price stability , the [European System of Central Banks ] shall support the general economic policies in the Union, as laid down in Article 3 …”, which includes in particular the sustainable development of Europe based on balanced economic growth and price stability, full employment and social progress. It is therefore clear that the goal of growth and employment is not abandoned but subordinated to the goal of price stability. Starting from this review of the definition of the ECB’s objectives, what conclusion can we draw on the orientation of monetary policy in the euro zone? Since the end of 2013, a few signs of economic recovery have appeared in the euro zone. Initial estimates of growth in the fourth quarter of 2013 have confirmed that the recession is ending, with GDP up 0.3%. Nevertheless, the economy is still in poor health. As proof, simply recall that 12% of the labour force is currently unemployed, which is the highest level since 1993 (see chart). Growth is expected to accelerate in 2014 and 2015. According to the ECB forecasts announced in March 2014, growth will hit 1.2% in 2014 and 1.5% in 2015, a pace that is still insufficient to lead to a rapid or significant reduction in the unemployment rate. In addition, since the end of 2013 inflation has dropped below the threshold of 1% and is coming dangerously close to a point where deflation is a risk. Furthermore, still according to the ECB forecasts, inflation should not exceed 1.0% in 2014, before pushing up to 1.3% in 2015 and 1.5% in 2016. It is in any case far from the mid-term target of 2%. The objective of price stability as defined by the ECB will therefore not be met. At his press conference in March, Mario Draghi announced that the maintenance of the ECB key interest rate  at 0.25% and the absence of additional (so-called unconventional) measures could stimulate the euro zone. The status quo was justified by the absence of signs of a more rapid fall in inflation. 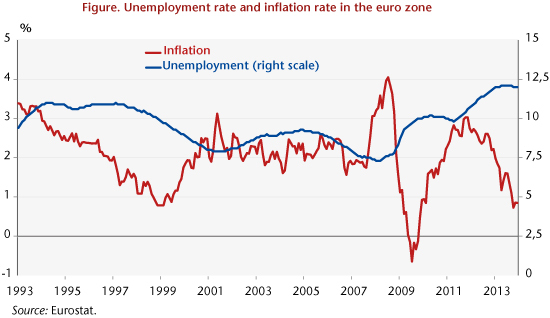 By taking this stand, the ECB President is indicating that he is satisfied with a situation where inflation remains permanently below the 2% level and where the euro zone is marked by persistent mass unemployment. Are we therefore supposed to reinterpret the definition of price stability invoked by the ECB and accept that the term below is more important in the eyes of the members of the ECB Governing Council than the term close to 2%? The answer to this question is obviously not neutral, since it would reflect a certain asymmetry in the central bank’s reaction to inflation, with the ECB reacting more quickly when inflation exceeds 2% than when it falls below 2%, including over the forecast horizon of its own team. But however its main objective is interpreted, the fact remains that the risk to price stability is not currently a barrier to the implementation of a more expansionary monetary policy. In these conditions, the ECB has all the room it needs to be actively concerned about its other objectives, including first of all growth and unemployment. So what tools does the ECB have available, knowing that with the benchmark rate at 0.25% it has only very limited manoeuvring room for a downward adjustment? The ECB must therefore use other levers. Communication by the central banks has played an increasing role in the implementation of monetary policy, as this can be used to influence agents’ expectations and hence the impact of decisions on inflation and growth. In this respect, the central bank has recently (July 2013) engaged in what is called forward guidance by stating that the key rate will be maintained at a low level for an extended period . The ECB could go further by conditioning a hike in the key interest rate on a target unemployment rate, as both the Bank of England and the Federal Reserve have done; this would give added substance to its objectives on employment and growth. In addition, unconventional measures could be used to strengthen the expansionary character of monetary policy. This mainly means measures that alter the size or composition of the central bank’s balance sheet, which would supplement the role of the reduction in short-term rates in influencing financing conditions. A recent report by France’s Council of Economic Analysis (see here) points in this direction, and in particular proposes that the ECB should purchase securitized small and medium enterprises’ (SME) loans in order to reduce the cost of business financing. The Outright monetary transactions (OMT) programme  could have been activated to support the reduction in long-term sovereign rates. The announcement of this measure did indeed contribute to lowering long-term sovereign rates in Spain and Italy, in particular because it sent a signal that the risk of collapse of the euro zone was being averted. Up to now, the ECB has not intervened in the markets to buy government securities. Yet given its unlimited capacity for intervention, doing this would help to reduce long-term rates. Note, however, that the OMT programme is currently being challenged by Germany’s Constitutional Court in Karlsruhe, which has questioned the programme’s constitutionality, with the case being referred to the European Court of Justice. A rejection or restriction of the ECB’s actions in this matter would be unfortunate. The ECB’s scope for intervention does of course need to be clarified. But it is also essential to retain the objectives of price stability and growth. The judges in Germany and at the European Court of Justice would be well advised to keep this in mind. ← Revising the budget in Croatia: yes, but … for whom and why?